Let me ask you a question at the beginning (do not scroll down to the picture yet). What is the best way of preventing students from eating in a library? I would imagine there is a range of possible approaches. 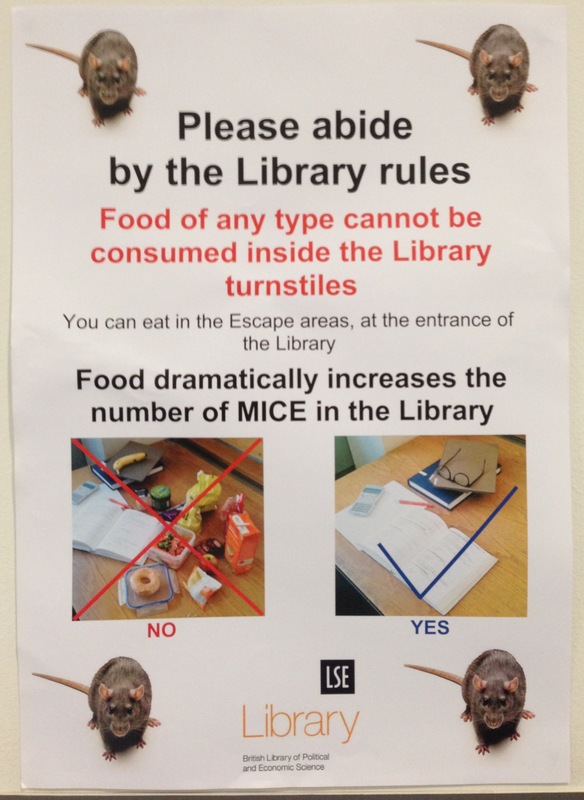 A simple polite notice saying ‘Please do not eat in the library’ might be one of them. If that one fails, one might add a statement that a £30 fine will be levied on anyone breaching the rule. They can also ban offending students from entering the library for a period of time or kick them out of the school all together. Or they can do a night-club style security check upon entering the library, confiscating any food found in bags. While some of these are ineffective (such as the first one), others are too strict or too expensive to implement given the relatively low risk/increase in costs resulting from this undesirable behaviour to the LSE community. So how about creating an environment in which the students would police themselves? Firstly, one needs to come up with a reason why would anyone bother telling somebody next to them to stop eating here. Things like increase in cleaning costs/increased noise levels/making books dirty are not on their own strong enough to spring people into action. We need something that resonates deep into all of us. Well, even if it only gets half of us going, it would be enough. What are girls really afraid of? Mice!! There you go! Let’s tell the girls that food dramatically increases the number of MICE in the library and nudge them towards not only not eating food themselves while there but also towards telling all their male friends to bloody stop eating here as there are going to be lots of mice otherwise. Somebody is yet to carry out a study if the poster worked or not but it is a great example of using behavioural science to influences people’s daily actions in a cost effective way.